Office Zone has just added the new Instant Card business card cutter to is line of office equipment. This new business card will make it easier for businesses to create their own business cards in-house. This month Office Zone, an online dealer of office equipment, announced the addition of the Instant Card business card cutter to is online selection. This new business card cutter is designed to help businesses of all types create their own business cards in-house and save operation costs in the process. This addition increases Office Zone's business card cutter selection to seven models. Most businesses use business cards for daily operations. It is a way to promote a company, distribute contact information and is an absolute necessity for sales associates and trade shows. Business cards are typically outsourced and produced in high volumes. This option isn't always practical for home and small businesses. This is and example where the Instant Card business card cutter may be an alternate option. Information on business cards can also become outdated due to company name changes, new employees, phone number changes and other reasons. Re-printing business cards can be inconvenient, take time and waste money. Creating business cards on the fly is another example of where the Instant Card business card cutter can be used. The Instant Card business card cutter takes a piece of paper, printed in any kind of laser or inkjet printer, and cuts it down into individual cards. It accepts a variety of paper including card stock, glossy and standard copy paper. After a few passes through the machine, standard-size business cards are ready to be passed out or be placed in a wallet. It uses a motor to run the slitter wheels and can create dozens of cards in minutes. 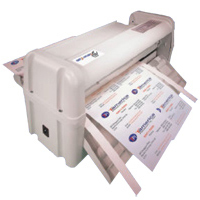 The Instant Card business card cutter can be seen here: http://www.officezone.com/business-card-slitter.htm?NR. Office Zone continues to increase its selection on a daily basis and offers options and alternatives to businesses trying to simplify business operations. To see the entire selection of business card cutters, please go here: http://www.officezone.com/cardcut1.htm?NR.